A Bristol-based team who create incredible structures and immersive dance spaces from what would otherwise be scrap metal, Arcadia don’t just make something special out of unnecessary waste… As a huge deal of the materials they use are often scrapped military vehicles, they turn a grim negative into an immensely positive experience… An experience that’s consistently soundtracked by awesome bass-heavy DJs. 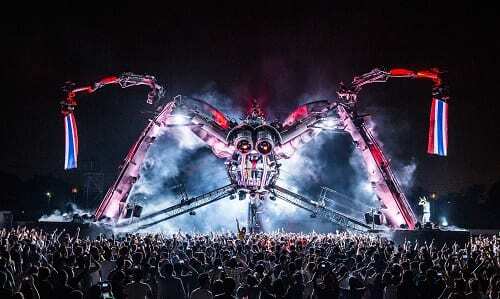 Those of us in the UK will already be familiar with Arcadia’s presence: what began as a small field in a previously quiet corner of Glastonbury Festival, their spider and aerial stunt show has now become one of the event’s key attractions. All roads to lead to Thailand: this is the second time you’ve shipped the legendary Spider out there. Tell me about your first trip… I hear it was an emotional experience! Yes it was incredible. We’ve always loved Thailand and the amazing spirit of the people we have met on our various travels there over the years. 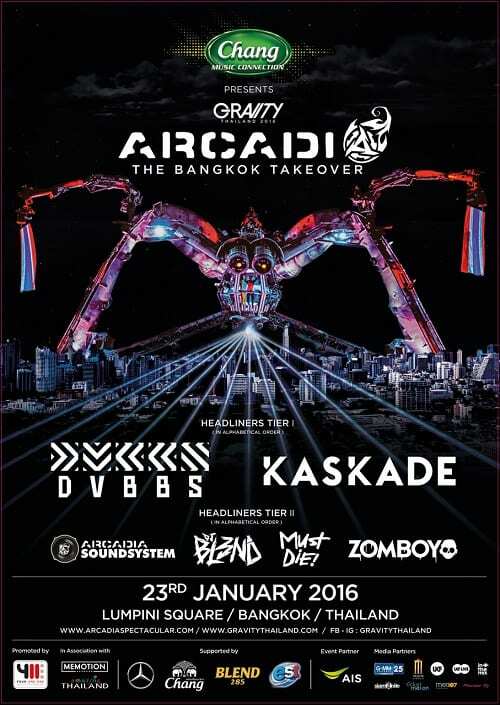 When we first spoke to Gravity about coming to Bangkok we were very excited and decided to make it happen whatever the challenges. We did a rehearsal show on the Thursday which got seen by lots of local residents looking over the fence who didn’t know what to expect… When the flames went off they all nearly fell over! On the night it was total magic. The dancefloor saw tens of thousands of people from all over the world all dancing to the same beat. The majority of people there were from Bangkok and so the Thai spirit really shone through, creating a totally different feeling to anything we have ever done before. I know you’ve hosted many other performances internationally but Thailand is the only place to have experienced the full Spider spectacle, right? Bringing the full Landing Show to Bangkok in 2014 was the icing on the cake. When the abduction happened the whole crowd joined in and jumped up and down trying to be the chosen one that got taken out of the crowd! 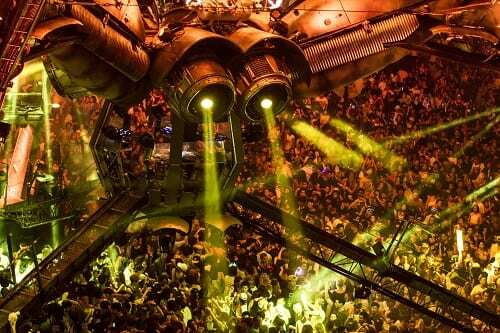 Well the recycled Spider structure weighs around 50 tonnes! It fits in four shipping containers and takes several weeks to reach Thailand. We had a tracking device in the container and watched the whole nail-biting journey online! When we turn up, we need about 50 of our UK crew and then about the same number of very skilled Thai hands working for a week to build and rig the Spider. I’m talking about the Spider as if it’s one singular individual but I’m assuming its undergone various hardware updates and rebuilds? Also, dumb question, but does he/she have a name? Well the Spider doesn’t have a name, but she was referred to as a ‘she’ by Bert several years ago and it’s stuck. It’s gone through many evolutions, always as a dance stage but not always as a spider. The first time we built a tripod out of the three Customs & Excise scanning units was in 2010. At the time we had a smaller rocket type stage made from an afterburner unit which we mounted on top of the three legs. It was pretty mental; the DJ had to climb a ladder and walk along a gangplank 10 meters high to get into the DJ booth! Then the following year we took the cranes off our lorries and mounted them to the structure, and we reconstructed the afterburner units to make some eyes and it became the monster it now is. Then finally we removed the live band stage under it, and with some more jet engine parts made one massive DJ booth. This meant the crowd could now go right under it, which really changed the potency of the experience. How about the development of your soundsystem as well? I know in the early years of Arcadia at Glastonbury it was too successful; so many people came to party with you that it was hard to hear the music unless you wormed your way to the front. Yes, in the old days we were never quite prepared for the size of the crowd that came… But we have a massive rig now! The system we use evolves year on year depending on the best technology available and sometimes the sensitivities of the location. Bangkok was by far the loudest it has ever been and that took the whole thing to a total new dimension! It always laid out as a six stack Ambisonic system in a large 80m hexagon. So the music comes from all around rather than just stereo which is a key part of the immersive feeling and sounds great wherever you are. However we do bulk it up with extra speakers under the stage as this is where it is most intense if you really want to lose yourself in the bass! It takes a while, but we love it. We spend a bit of time each year driving round the country (and the world now) looking at scrapyards and chucking ideas around in the evenings. There’s sadly not one big shopping centre full of scrap, but it’s all about the hub. The satisfaction of finding big lumps of technology originally designed to cause death and destruction, diverting it from the scrapyards and turning it into machines that generate peace love and unity, is second to none… even if you’re not a bit of a hippy! What’s the best treasure you’ve ever found and utilised? There have been so many, but the eight-wheeled amphibious truck that we turned into a giant bug that opens its wings to present a DJ inside was pretty cool. There’s a strong sense of community to everything you guys do isn’t there? The people who make up Arcadia are incredibly diverse and the relationships between them all are the essence of what we bring. We consist of everyone from aerialists to engineers to musicians to the most incredible crane drivers from the local scrap yard. All these people have to not only trust and respect each other on a creative level to realise which are the strongest ideas to push forwards, they’re also trusting each other with their lives when they go out on a crane or climb past a dormant 30ft flame thrower. What happens during a show when 50 odd people pull something off in synchronisation is truly amazing. We always encourage a good crew party after where everyone can let off steam and show proper appreciation for each other. In a sense, you could definitely say that we are a family. While we’re talking community – picking artists is unique process for you isn’t it? Most of the artists really get it and they all seem to love being part of it. I think there are so many huge commercial gigs now where the DJ can play at four events over a weekend where they are pushed through the dressing rooms and onto the stage without actually feeling connected to the show they are part of. I think a lot of musicians really love the Spider as they are part of something huge, there’s loads of other people on the stage jamming the effects and the cranes to their tunes which adds another dimension and the shockwave and heat of the flames can make a musical drop totally turbocharge the dance floor! Some electronic music is best listened to in a dark room or in solitude… which is cool also. There have been so many classic moments, but off the top of my head – Roni Size did a live Reprazent show recently in on the Spider at an event in the very centre of Bristol which was amazing, Fatboy Slim smashed it one year, Black Sun Empire were incredible in 2010 and Skrillex had a good time up there too. We’re really excited about how the line-up for Glastonbury 2016 is shaping up too – but that’s all still under wraps for a while yet. Bringing us back full circle, 2016’s Gravity show has moved from the outskirts of the city to the centre… Please tell us about the new location and how this has influenced the set-up and performance? Being deeper in the heart of the city is great. The new location has the most amazing backdrop and can be looked down upon from lots of surrounding buildings and hotels. We are not bringing the aerial show this year as we are focused on making it a full on rave with a huge line-up for all the inner-city party crowd and it promises to go down in history as one of the more high-octane parties we have done.